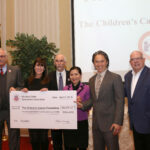 The Children’s Cancer Foundation, Inc. (CCF) was honored to be named the beneficiary of the 3rd Annual Maryland Governor’s Cup Taekwondo Championship on Saturday, March 23, 2019. 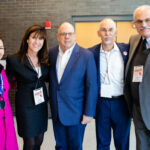 Thanks to Honorary Chairs Governor Larry Hogan​ and First Lady Yumi Hogan, CCF was again the recipient of the event’s proceeds. Attending the event, in addition to CCF staff, were board members Steve Coomes and John Carver. The event was organized by the Maryland State Taekwondo Association (MSTA) and represents members from all over the state. The event was emceed by Senior Master Yong Seong “CJ” Chang. MSTA’s current President, Senior Master Chien Vuong also thanked guests and dignitaries. In addition to the Taekwondo competition with athletes from the Mid-Atlantic region, the day featured a ceremony and performances from Taekwondo demonstration teams and dance groups from around the world. On April 5, the Governor and First Lady hosted a reception in Annapolis to recognize the 4th Annual Maryland Taekwondo Day and the winners of the 3rd Governor’s Cup Taekwondo Championship held on March 23rd. Thank you to Master Chien Vuong, President, Maryland State Taekwondo Association, Master CJ Chang of the U.S. Taekwondo Academy in Harford County, and all the participants. The opening ceremony began with Taekwondo demonstrations and performers. CCF Executive Director Tasha Museles and CCF Board Members John Carver and Steve Coomes greeted the Hogans. Governor Hogan awards the competitors. 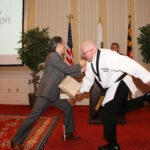 In Annapolis, Taekwondo Day included awarding trophies to the event’s winners, and Gov. Hogan demonstrating his own Taekwondo skills. CCF was generously awarded with proceeds from the tournament.